From tree kangaroos to sea turtles and cassowaries to crocodiles, the Wet Tropics World Heritage Area harbours some of Australia’s most intriguing, rare and rarely-seen species. Encountering these fascinating far northern inhabitants is a highly rated thrill for many visitors to tropical Queensland so, if you are headed north any time soon, here’s our pick of places to spot them. Plus we’ve got all the great base camp spots and some curious facts you probably don’t know about northern Australia’s most captivating creatures. If you crossed a bear with a kangaroo, the result might look something like the heavily muscled, canopy-dwelling Lumholtz’s tree-kangaroo. As few as 2000 are estimated to exist in Queensland’s far northern forests, and you won’t find them anywhere else in the world. Zoologist Carl Lumholtz and his Aboriginal guides described the species back in 1882 on the Cardwell Range, 185km south of Cairns. Since then, Mount Hypipamee National Park (NP) near Ravenshoe on the Atherton Tablelands has become the place to spot them. 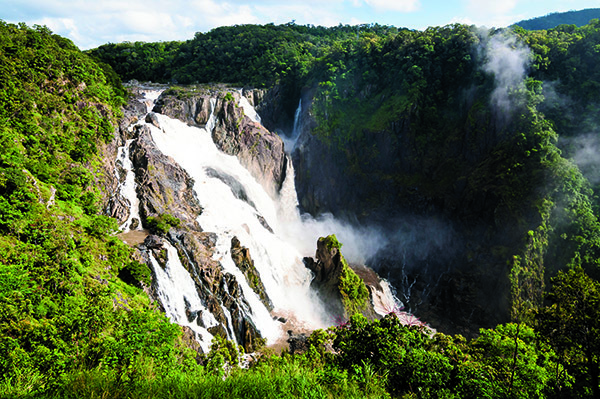 This high-altitude rainforest also supports a huge variety of gliders and possums, and visitors flock here to hike to Dinner Falls and stand on the rim of a dramatic, water-filled volcanic crater with its sheer granite walls that plunge 140m deep. During the day you’d have to be extremely lucky to spot the normally-nocturnal Lumholtz’s tree-kangaroo (dendrolagus lumholtzi), but it’s not out of the question. On an early morning walk through the park five years ago, not one but two Lumholtz’s tree-kangaroos bounded across our path, stunning us as they climbed swiftly up a nearby tree, their long tails swinging free. From the safety of the canopy, they turned to meet our stares and delighted us by staying within sight as we snapped off photos. Known to Indigenous Australians as Mabi, the Lumholtz’s tree-kangaroo spends most of its time in the rainforest canopy but is extremely agile on the ground too. For the best chance of spotting one, hit the walking trails through Mount Hypipamee NP early in the morning before the day-trippers arrive. While you can’t overnight in the national park, the free camp at nearby Archer Creek Rest Area is a spacious, shady spot that accommodates big rigs and pets, close to Big Millstream, Australia’s widest single-drop waterfall. 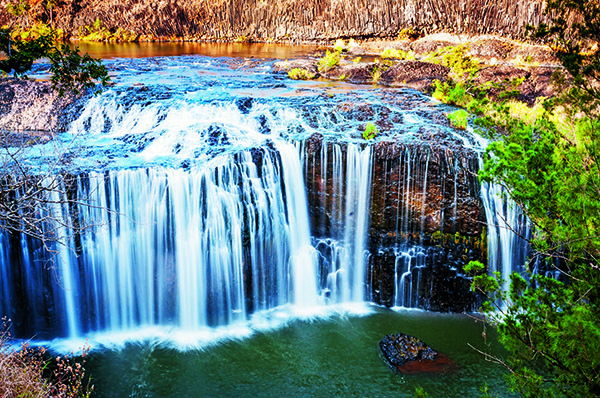 Getting there: Mount Hypipamee NP is located 24km south of Atherton along the Kennedy Highway. Camping: 18km from Ravenshoe, Archer Creek Rest Area provides toilets and picnic tables. Classified as endangered, Australia’s largest flightless bird is an evolutionary survivor with a recently-discovered sensory quirk shared with dinosaurs and elephants. The distinctive casque that crowns the cassowary’s bright blue head is believed to help it to detect sounds from very distant cassowaries, a technique known as infrasound. The casque also protects these solitary creatures in conflicts with other cassowaries – or humans should the bird feel cornered or threatened. Males protecting their young (yes, the blokes raise the kids) or defending their territory can become particularly aggressive and since they weigh around 65kg and reach speeds of up to 50km/h, should be treated with extreme caution if you encounter one while walking in the rainforest. There are only around 4000 southern cassowaries (Casuarius casuarius johnsoni) left in the wild, and Mission Beach has a high concentration of them, despite being the place where cassowaries are most at risk from habitat loss, dog attacks and vehicle strikes. Behind Mission Beach’s 14km-long strip of squeaky white sand, Djiru NP protects a rare pocket of Licuala fan palm forest whose fruit is a favourite cassowary snack. Two of the best trails in the park are the Musgravea hiking and biking trail (6km one-way) and the easy Fan Palm Walk (1.3km/20 minutes) that loops beneath the two metre-wide fan palms that appear as bright green umbrellas towering 15 metres above the forest floor. Getting there: Turn-off the Bruce Highway just north of Tully and drive 26km to Mission Beach. Camping: Council-run caravan parks at Mission Beach (powered and tent sites) and Bingil Bay (unpowered sites only) provide hot showers, toilets and laundry (no generators). Fees: $20/$25 unpowered/powered. Dogs on leads are permitted. In Australia’s far north, these superior, prehistoric hunters dominate the food chain. With excellent eyesight, a keen sense of smell and the ability to detect and hunt down prey in the murkiest of waterways, estuarine crocodiles are fascinating, fearful creatures. What you might not know is that Crocodylus porosus can reach speeds of around 10km/h in short bursts and can stay underwater and out of sight for an hour or more by slowing their heart rate to 2-3 beats per minute. Another evolutionary survivor, the estuarine crocodile can live for 70 to 100 years, and when they die, their bones can be read like the growth rings of a tree. The biggest myth about the world’s largest reptile lies with their name. Estuarine or saltwater crocodiles are not restricted to saltwater habitats, but can and do thrive in billabongs, creeks, rivers and freshwater waterholes hundreds of kilometres inland, at times surviving in fresh water just a few feet deep. Hunted to the brink of extinction from the 1940s to 1960s, crocodile numbers (and the number of attacks on humans) are on the rise. Statistics show that men are more likely than women to be attacked, and young males (aged 16-35 years) are most at risk. To stay safe, the rules are simple: never swim in crocodile habitat, camp well away from the water’s edge and when boating, keep your arms and legs on board. Be aware that estuarine crocodiles are more active at night and more aggressive during their September to March breeding season. One of the best ways to safely encounter salties in FNQ is on a Daintree River boat cruise, preferably at low tide when the crocs can be seen sunning themselves on the muddy banks. If you are looking to overnight close by, check out the beachfront powered sites at Wonga Beach Caravan Park. Getting there: Daintree River is located 116km north of Cairns. Camping: Campsites at Wonga Beach Caravan Park. Fees: $37/$32 (powered/unpowered), no pets. A relic of the age of the dinosaurs, sea turtles are one of the most easily observed marine animals, and Far North Queensland’s Great Barrier Reef islands and remote beaches protect some of their best habitat. 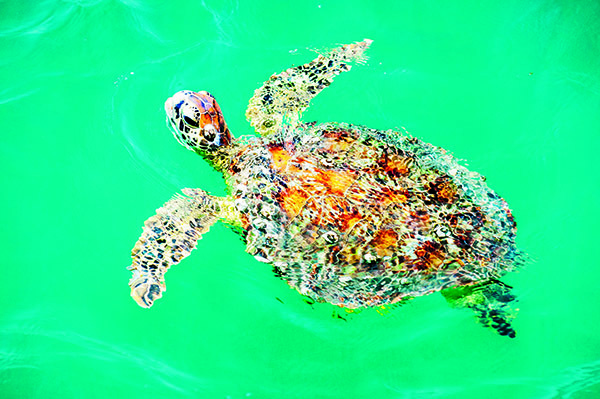 Six of the world’s seven sea turtle species visit Australian shores: green, hawksbill, loggerhead, olive ridley, Australian flatback and the leatherback. Unfortunately, all are classified either endangered or vulnerable in Australia. Their biggest threat comes from discarded plastic bags that when afloat, mimic the jellyfish that many turtles feed on and when consumed, change the turtle’s buoyancy, keeping it afloat, hungry and vulnerable to boat strikes and predator attacks. A little known fact about the green sea turtle (named for the greenish colour of their fat), is that they often sunbake on the surface to boost their intake of vitamin D, which is lacking from their mainly vegetarian diet. The Australian flatback turtle is our only endemic sea turtle, while the olive ridley is the smallest and the hawksbill turtle the most beautiful. Enormous, jellyfish-eating leatherback turtles (800kg and two metres long) can dive to depths of more than 1100 metres, while large-headed loggerheads don’t begin mating until they are between 30 and 50 years old! One of the most accessible places in the far north to encounter sea turtles is off coral-fringed Fitzroy Island, home to the Cairns Turtle Rehabilitation Centre that provides daily educational tours for visitors (www.saveourseaturtles.com.au). 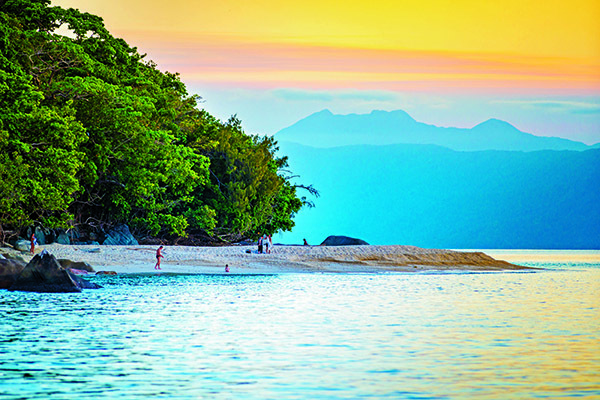 Getting there: Fitzroy Island is located 45 minutes by fast ferry from Cairns. Camping: Fitzroy Island Resort (www.fitzroyisland.com) manages a beachfront campground with toilets, gas barbecues, drinking water and a picnic shelter. Fees: $35/night (max 4 people). Of all the far north’s mega bats, the spectacled flying fox is one of the most common and troublesome, mainly because it doesn’t mind living in close proximity to us, our city parks and even in our backyards. If it could be described as beautiful, cute or cuddly it might be more beloved, yet the spectacled flying fox (Pteropus conspicillatus) plays a vital role in dispersing rainforest seeds and pollen as it feeds. Distinguished by the pale fur that rings their eyes like a pair of spectacles, these communal flying foxes roost in large numbers by day and feed in the cool of night when forest flowers open, using their excellent eyesight rather than sonar or echo-location to move around. A wingspan of up to 1.6m enables them to reach speeds of 40km/h, and they can travel up to 50km each night to feed. Their social structure is very complex and they use more than 20 different calls to communicate with each other. Contrary to popular belief (and the pungent odour of their canopy camps), spectacled flying foxes are very clean animals that constantly groom themselves. A fixture around the Cairns CBD, they are commonly spotted in the paperbark trees around the city library on Abbott Street. 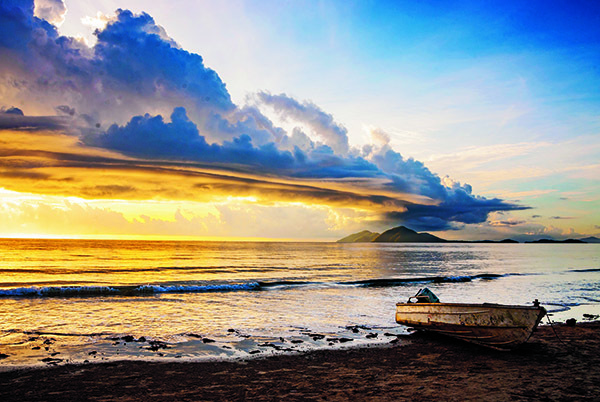 While overnighting in Cairns, the Palm Cove Holiday Park on the beachfront at Palm Cove is a scenic choice. Getting there: Follow the Captain Cook Highway 27km north of Cairns CBD to Palm Cove and turn left onto Williams Esplanade. A stunning resident of FNQ’s tropical rainforests, this beautiful tropical butterfly is Australia’s largest with wings that span over 16cm and display a dramatic canvas of yellow, emerald green and black. While the female is larger, the male Cairns birdwing butterfly (Ornithoptera priamus) is brighter, its wings streaked with vibrant green alongside a sunny yellow and red body. Equally attractive and endemic to the far north, the brilliant Ulysses butterfly (Papilio ulysses) is one of the brightest in the rainforest, with electric blue wings edged in black. If you live in the region, planting the lovely euodia tree will lure the Ulysses who love the small pink flowers. The far north’s Wet Tropics World Heritage Area harbours more than 60 per cent of Australia’s butterfly species in forests that stretch from Townsville to Cooktown. One of best – and wettest – places to go butterfly spotting is Babinda Boulders, a magnificent rainforested waterhole nestled beneath Mt Bartle Frere, Queensland’s highest mountain (1622m). There’s a picnic area, free campground and a walking track that leads to Devils Pool Lookout (940m return). Getting there: Turn-off the Bruce Highway at Babinda, 60km south of Cairns, and continue for 5km to the Boulders. Camping: Unpowered campsites come with toilets, coldwater showers, fireplaces, picnic tables and rubbish bins (72 hour limit).